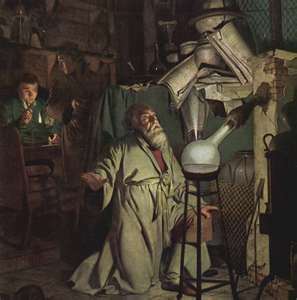 Just as chemistry has many alchemists to thank for knowledge gained on the road to easy gold, we in the government school business send props to our Utopian-dreaming fathers of publik skools. Like the elusive pot of gold, government schools created a dystopia: An imaginary place where people lead dehumanized and fearful lives. But, we continue the search for the impossible by putting our faith and kids in the black cauldron of coercive government schooling. If only we could discover the ancient formula buried in the floorboards of a dust-covered laboratory. The search for the missing ingredient (school reform) is intense. We can’t seem to admit that the system of schooling is not broken. It’s doing exactly what it was created to do. Failing American schools are no mystery to anyone: Especially those tossed in the roiling pot of public collectivism. Students spend their school days graded by age, bored senseless, fed State doublespeak, and made to endure useless tests and worksheets. I tell them, “This is NOT the real world.” When’s the last time you saw adults have to ask permission to go to the bathroom or walk in a straight line down a hallway? That’s right, in prison. The few that do open their eyes to their predicament, I target for my Education Vigilante Apprenticeship Program. They’re invited to really explore individual freedom, out-side-the-cauldron stuff (self-ownership, liberty, freedom, etc.). Thinning the herd is a methodical process. I use a one-on-one strategy. There’s nothing quite like seeing the liberty light bulb start to glow in a kids eyes. However, the infatuation with government dependence is multi-generational and sickening. Students aren’t taught real history. The whole language reading programs ensure functional illiteracy. Deep down they know schooling is not right. By the way, a huge hat tip to all those parents who realized the dumbing process of schooling and rescued their children from the State alchemy laboratory. There’s an estimated 2 million American home schoolers who pulled the plug on schooling. Progressives and other statist types hate this growing trend. They brag on government schools, not for their ability to educate, but for the social education forced upon the captives in the cinder block cells. In my state, a score of 800 will meet standards on the high-stakes standardized tests. What parents are not told is that if their child scores 800 on all five sections of the test, they really only answered 50 percent of the questions correctly. Wow Johnny, you passed the math portion! It’s the only time he’ll get an ice cream party and a movie for making a F on a math test. It’s risky, but I promote John Taylor Gatto‘s idea of the Bartleby Project when I safely can. Forced schooling is the largest business in the country. Not counting salaries and expensive school houses that eerily resemble prisons, special interest groups and companies make huge profits from textbooks, standardized testing materials, psychotropic drugs, and food from the Industrial Food Machine. I find it hard to believe the eco-extremists aren’t organizing sit-ins at the Department of Education to stop all the sacrificial tree killings to produce this wasted paper! I know why. Schools promote these groups with mad-science propaganda. They won’t let pesky facts get in the way of their truth. Why would they oppose the best recruiting agency for their cause? They won’t. If you found this helpful, maybe you could help get the word out by sharing it with your social network, family, and friends. We certainly appreciate all the support we get from you! I’ve never suffered a gunshot wound. I had a friend who was ventilated by some grudge-holding thug. Apparently, this idiot wanted to get even for a business deal that went south. He chased my friend through the bays of his car wash shooting at him with a .22 revolver. Fortunately, only his love handles got pierced. After recovering, my buddy began making a plan to never get caught defenseless again. 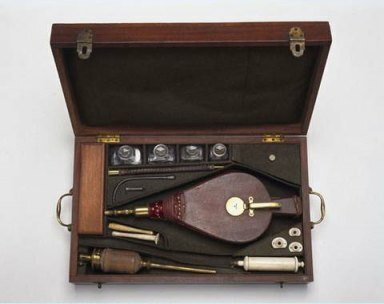 Tobacco Smoke Enema – Nice! What follows may be painful for some. It may hurt as much as the old tobacco smoke enema. The only difference is that I’m NOT blowing smoke up yours. Why do so many Americans refuse to prepare for worst case situations? Or better yet, why do they not even prep for potential everyday emergencies? You’ve seen them pass you on their donut tire at 67 miles per hour heading to the 7-11 to get their winning lotto ticket. I’m sure with all their winnings they’ll be able to prepare, right? Being prepared doesn’t take huge financial windfalls. So why do so many people think it’s a stupid idea to be prepared? Here’s my list. A) Peer Pressure. Remember school days? Who wants to be standing outside looking in on the popular group? We all want to feel important and part of a group. We’re social animals. The group we associate with can determine our future. My daddy always told me, “If you lay down with dogs, you’ll get up with fleas.” If you hang out with prepared individuals, you’re likely to become more prepared. As prepping goes more mainstream, many in the media portray preppers as crazy, racist, isolationist, anti-everything survivalist. None of us want that label. There’s always a few fringe types in any group that make media salivary glands wet. The new growth to the prepper movement is fueled by “normal” people like soccer moms, taxpaying business owners, and law-abiding folk. B) Government Schools. My day job is to teach at a local school government indoctrination center. My advice to any preparedness minded parent of school aged children: AVOID GOVERNMENT SCHOOLS NO MATTER THE COST! Government schools manage ignorance for profit. Read more here. Preparedness and survival requires self-reliance and the ability to think for yourself. The State forces kids to spend their most formative 12 years (16+ including college) learning how not to learn, but conform. Finding learning in government schools is as hard as finding a corner in a round room. A quarter of their lives circle the toilet bowl taking the path of least resistance to the collective’s sewage plant to be recycled and made “safe” and useful tax-payers. Parent choices greatly increase or decrease their kid’s survivability. So what’s the solution for educating prepared individuals? Homeschooling may seem impossible. Both parents have to work to keep the family feed, clothed and sheltered. It comes down to our priorities. What “important” stuff can we kick to the curb to rescue our kids from government gulags and offer them a real education? I can’t answer that for you. Humans are individuals with unique situations. One size does not fit all. Homeschool, unschool, anything but government school. C) Dependence. We’ve abandoned our roots. Due to reason # (B), our history is intentionally distorted. I often ask kids to tell me about historical figures and events like Abraham Lincoln, the War of Northern Aggression, or more recently – the Federal Reserve. As to Lincoln and the unCivil War, kids today are taught that Lincoln invaded the south to free the slaves. While I abhor the concept of someone owning another person, I know that Lincoln didn’t care about slaves being freed. Follow the money. When my ancestors stepped off a boat in 1735, there was no free lunch or welcome basket full of government goodies. dependence on their own ability, family, and immediate like-minded friends started my family journey in America. 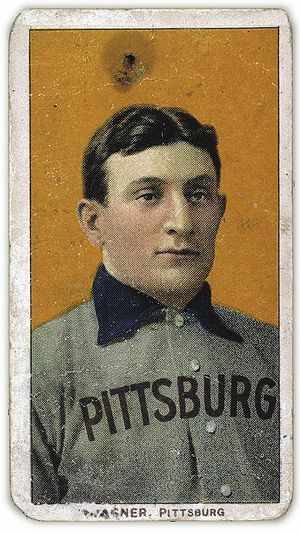 Their self-reliant skills didn’t insulate them from set-backs and calamities. The find-a-way-to-get-the-job-done attitude is what helped me and my family survive to this point. Thankfully, I’m part of the remnant of self-reliance left in our country. When their Katrina-style disasters hit, communities rebuilt without the help of FEMA. This spirit of pioneering one’s own life has been traded for dependence. Even after natural and man-made disasters, I’m amazed at the false hope Americans place in our government’s ability to sweep in for the rescue. It’s a stupid idea most Americans hold. D) MBM (Morally Bankrupt Morons). “All I need is guns and ammo to survive. When the SHTF, I’ll just take what I need.” I’ve read this statement, or similar sentiments on many preparedness/survival forums. I want to think they were just trolls. But I know there are lazy, corrupt individuals that will resort to this style of survival – for a while. Do they think that the very people they plan to plunder are not able and ready to defend their personal property? I saw an episode of Doomsday Preppers where one in their group stated that they don’t buy weapons and ammo. Their plan, when the armed horde of hungry looters show up, is to show them all their food and offer more if they leave them unharmed. Maybe some MBM’s will live to loot another day. I wouldn’t place my hopes of survival in this strategy. Your mileage may very. Some people have an aversion, even a fear of tools called guns. In the wake of Sandy Hook, I’m encouraged by the bare ammo shelves and empty gun stores. It gives me hope that people are listening to their “gut” and making preparations for their future. Defending their life, liberty, and property against enemies, foreign and domestic, seems to be catching on. Why shouldn’t it? It’s our natural right. I’ll put real simple here. I don’t care who, whether pastor, clergyman, senator, family member, or Santa Clause tells you guns are evil and you don’t need them, put as much distance between them and you as possible. Part ways. Period. Back to the MBM. These individuals embody the entitlement mentality and our moral backsliding in this country. Hunger is a strong motivator for stupid stuff. I’ve never been shot, and I’ve never shot anyone else. I pray to Papa that I never have to face the choice of kill or be killed. If that time comes, and I’m afraid it will, we each have to wrestle before hand with our resolve to protect our life, liberty, and happiness. Read the signs and heed legitimate warnings. Don’t live in fear. Prepare accordingly my friends. Avoid being low hanging fruit. E) Nationalism. Arrogance leads to a fall. It could never happen here. This is America! We’re the envy of the world. I’m convinced that this is the thinking of the mentally ill – or the historically illiterate. I hear the disdain coming from ‘educated’ folk all the time. I think they suffer from altitude sickness in their ivory towers. Totalitarianism happens one step at a time. As long as we are allowed to wake up in our homes, drink our coffee, go to work, watch our TV programs, rinse and repeat, tyranny becomes routine. Vigilance dies. It’s frog-boiling 101. Gradually heat the pot of water and the frogs don’t jump out. I love my country. I love my freedom more. Humility and honesty seem to be lost traits. I hope that there are enough people waking up to help rebuild our crumbling republic. .
F) Mental Enslavement. With enough time, falling water can cut through rock. Is what we call ‘freedom’ really freedom? Many in the patriot movement call themselves “freedom lovers” yet accept tyranny as normal. We’ve all heard the battle cry of patriot-lite types. You’ll have to pry my guns from my cold dead fingers! No worries. The State will gladly oblige. Yet, the water fall of tyranny continues to eroded our liberties. It’s like watching a catastrophic train wreck in slow motion. We have as much freedom and liberty as the State allows. To realize and enjoy our natural rights, we must free our minds. Stop listening to talking heads. Free your mind. Don’t be deceived. The smoke screen isn’t just coming from the liberal media types. I use to listen to conservative talk radio religiously. I can’t stomach the party line talk anymore. Some pundits distinguish themselves as conservative, not republican. Liberal vs. conservative, Democrat vs. Republican. They are just different sides of the same liberty-destroying coin. Flip the coin to choose your master. G) Stifled Self-government. Critical thinking is dead (See # F). Passivity is encouraged, even demanded. Habits form us. We prefer our guardians of darkness. It hides our secret need for fake security. We are addicted to our velvet chains. The principles of non-aggression and self-ownership have been systematically eradicated. Most Americans favor State coercion over individualism and self-reliance. Voluntary relationships between free individuals is no longer viewed as common sense. Our State monopoly on schooling crusades for government dependence and even sites individualism as a mental disorder. Rejecting government dogma invites the use of ‘legal’ force, or the threat of force, to reform rebellious subjects of the State’s idea of being a good citizen. We have to get over ourselves and our dependency on government ‘safety’ nets. That is, if we want to be self-reliant. Breaking the addiction sometimes comes step-by-step. Sometimes it’s cold turkey that works. We’re all different. Do what works for you. Don’t wait. Take one step towards building preparedness and resilience each day. What physical, mental, spiritual, emotional steps did you make today? Don’t beat yourself up if any of these 7 reasons apply to you. It’s hard not to relate to some of these reasons. But who wants to be the person walking out of the restaurant bathroom with a strip of toilet paper stuck to their heel? How embarrassing. So much is riding on you – your family, community, and even what’s left of our country. Dirt Road Girl was shocked. She’s witnessed me lugging storage boxes from attic to shop to moving trucks for years. They were my “precious”. They ranged from the 1970’s to 2002. The idea of the judicial branch of our government balancing justice gives us warm-fuzzy feelings. Reality, if you’re able to stomach it, paints another picture. If you resist the State Compulsory Attendance Law on the basis it violates your natural rights as an individual to raise and educate your children in the way you see fit, you’ll be pursued and prosecuted – not for your beliefs, but for contempt of the law or court. The State has little patience for contumacious parents. 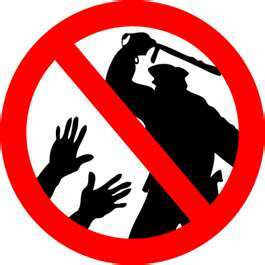 Just the threat of legal force to arrest is enough to bring compliance. If you’re a hard case and resist enough, the State will kill you. A more recent story of State child snatchers illegally kidnapping a child who has been home schooled her entire life. The mother won this round, but it ain’t over yet. Child Protection Services and the State prosecutor were knocked down but not out. Embarrassed, prosecutors are gearing up for another siege on the physically handicapped child and her family. 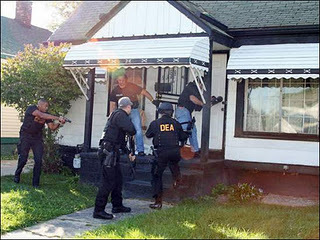 They used a SWAT team the first try. Maybe they’ll just burn ’em out next time. How dare this mom. She believes she has a right to make medical and educational decisions for her own child. This brave mom simply needs to be educated by past educrat elitists. A big Hat Tip to my friend at Durable Faith for sharing this with me. Below are a few quotes taken from Sheldon Richman’s book, Separating School & State: How To Liberate American Families. Chapter 3: Why There Are Public Schools – Read the entire chapter here. Proceed with caution my preparedness friends. Separating School & State: How to Liberate America’s Families. Book: In Separating School & State, Sheldon Richman effectively and comprehensively analyzes the failures of public schooling in America and explains the ideas and ideology behind the case for compulsory education. My experience as a government school teacher can confirm Mr. Rappoport’s claims in his article. Remember the kid who pointed a pizza chewed into the shape of a gun at lunch? It gets worse. Should we assume that because cops and school officials can’t stop real crimes, they’re settling for stopping fake crimes. As a seasoned education insider (teacher), I use to leap at every chance to expose the failures of compulsory education. I soon realized that the statist system of forced schooling can never be changed to actually educate young minds. I haven’t given up, yet. The State’s constant hammering of round pegs into square holes will never change. Only the size of the hammer changes. Why? Grinding individuals into collectivized ground meat, neatly packaged into uniform, tasteless, wrapped packages to nourish the ruling elite – all for the children we’re told – is the mission of government education. This is excerpted from The Underachieving School by John Holt. Reprinted with permission from Sentient Publications. We need to get kids out of the school buildings, and give them a chance to learn about the world at first hand. It is a very recent idea, and a crazy one, that the way to teach our young people about the world they live in is to take them out of it and shut them up in brick boxes. Aside from their parents, most children never have any close contact with any adults except people whose sole business is children. No wonder they have no idea what adult life or work is like. A child learning to talk does not learn by being corrected all the time – if corrected too much, he will stop talking. He compares, a thousand times a day, the difference between language as he uses it and as those around him use it. Bit by bit, he makes the necessary changes to make his language like other peoples. In the same way, kids learning to do all the other things they learn without adult teachers – to walk, run, climb, whistle, ride a bike, skate, play games, jump rope – compare their own performance with what more skilled people do, and slowly make the needed changes. But in school we never give a child a chance to detect his mistakes, let alone correct them. We do it all for him. We act as if we thought he would never notice a mistake unless it was pointed out to him, or correct it unless he was made to. Soon he becomes dependent on the expert. We should let him do it himself. Let him figure out what this word says, what is the answer to that problem, whether this is a good way of saying or doing this or that. Our job should be to help him when he tells us that he can’t find a way to get the right answer. Let’s get rid of all this nonsense of grades, exams, marks. We don’t know now, and we never will know, how to measure what another person knows or understands. We certainly can’t find out by asking him questions. All we find out is what he doesn’t know which is what most tests are for, anyway. Throw it all out, and let the child learn what every educated person must someday learn, how to measure his own understanding, how to know what he knows or does not know. The above is excerpted from The Underachieving School by John Holt. Reprinted with permission from Sentient Publications. Here’s what I found interesting this week. Storey’s Guide to Raising Chickens for Meat (H/T to Resilient News I think 🙂 – if not, here’s a link for you) A great article on selecting birds that aren’t chicken coop potatoes. It’s a long article over at Mother Earth News filled with useful advice and practical know-how, Gail Damerow’s trusted “Storey’s Guide to Raising Chickens” will steer you through every chicken situation, from hatching chicks to collecting and storing eggs. Liberty Classroom I’ve signed up for Tom Woods’s Liberty Classroom as a Christmas gift to myself. I’m learning history and economics my teachers never taught me in all my schooling years. For $100 bucks you can get a real education – not the watered down revisionist history taught in government schools. NOTE: The cost of this college level material is cheaper than the price of a quick trip to the supermarket. Learn real history and economics in your car. Ask questions of the experts. Become a ferocious debater. Herbal Honey, Herbal Syrup and Cough Drops With a name like Susun S. Weed, she can’t help but be an herbal expert. Her article appears over at Nature Skills. Susun S. Weed is a world-renowned herbalist, teacher, wise woman practitioner and author of many books including Healing Wise. Hope y’all have a great weekend. Keep doing the stuff! The problem of education in American public schools has been raised over and over again for over two decades now. The problem has been going on for way longer than 20 years… But it was only in the late 80s that we started to realise our minds were manipulated by the government ever since we were little kids, via school. The question I want to address to you today is: did we wake up too late? Using education to turn people into sheeple has its roots all the way back in the Protestant Reformation, when reformers turned teaching children into a Christian duty, so the little ones can learn all about obedience and punishment from the age of seven. They thought raising children this way would drive the original sin out of them and also make it easier for them to respect the ten commandments. That was pretty much the only purpose of going to school: learning how to be an obedient servant of God. A noble cause, I might say… but the means turned out to be all wrong. When schools were transferred under the government`s custody, the purpose slightly changed, but the means remained the same. Now, kids were trained to obey to the state, not to God. They were taught to blindly follow rules and not question anything. Thus, the sheeple was born. However, that was not enough for the government. The zombie factory was not working with the precision of a swiss watch and that only meant one thing: greater chances for creative, free minds to find a loop in the system and start a rebellion. And that was something the government could not risk. Simple is better. The institutionalized school system was set up to bastardize the learning process. The rules, bells, standardized testing, and structured control, to name a few culprits, are all part the corruption of meaningful learning. Sides are taken on how to reform “education”. What the intellectual reformers miss is so simple. Look to the caveman for the answers. The classes I remember learning in were Shop, Art, Physical Education, 4th grade Math, and 6th grade English. I loved to draw, play sports, build stuff, and write. The 4th grade Math class was fun because I learned all my multiplication tables that year. The English class was taught by my aunt. That’s not the only reason I loved that class. Aunt Cindy would send the whole class outside to write or draw. Our class published a poetry book that year. One of my drawings and short stories got included. I still remember the winter scene I drew. After 50 years, I finally made fire with sticks – almost. Episodes of the TV show “Daniel Boone” inspired me to throw knives, axes, and other sharp objects into trees and barn wood in my youth. I always wanted to be like Daniel. An explorer, pioneer, trailblazing through our backwoods farm. I created many blisters on my hands rubbing sticks together. I know. Friction was in the wrong area. It was too hard. However, the desire to create fire from friction never died. I simply grew up. Imagine the first cavemen stumbling over the thought of making fire. Well, it was probably a cave-babe that connected the dots. The ladies are smart like that. Any who, life changed when Grok could produce fire on demand. They had observed this fiery phenomenon after the loud booms from the sky. They even chased the blaze. But failed to harness it. They had witnessed it char flesh. Quite tasty indeed. “If only we could start one from, um, scratch,” mused Grok, rubbing his hands together vigorously. Ah ha! Friction. Heat. Fire! The rest is history. I’ve started fires from flint and steel, storm proof matches, fancy survivor sparklers, and wrongly wiring a starter switch on my truck. But the most primitive fire starting method had alluded me. Rubbing sticks together. Our recent discussion in Science class sparked my half century old interest. Newton’s First Law of Motion: Every object in a state of uniform motion tends to remain in that state of motion unless an external force is applied to it. The obvious outside force is gravity. How about friction? Well, there it was. The needed spark! Memories of blisters, bug bites, and no fire roared back into my psyche. A challenge. I’ll make fire with friction for my students! I accepted the challenge. Failure was not an option. I refuse to be embarrassed in front of 30 eighth graders. Caveman Chemistry to the rescue. 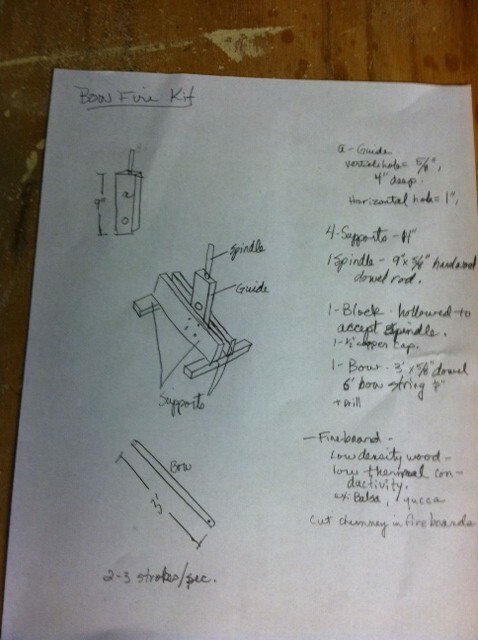 The first project in his book is a plan for a fire bow kit with training wheels. It’s modern. It’s controlled. It’s genius. Why didn’t I think of this 40 years ago. It’s so simple even an eighth grade teacher can do it. To reproduce the Fire Bow Kit, you’ll need some dimensional lumber (2 x 4’s), string, dowel rod, suitable fire board material, fasteners and a few tools. An open mind. Purists can stick with sticks. 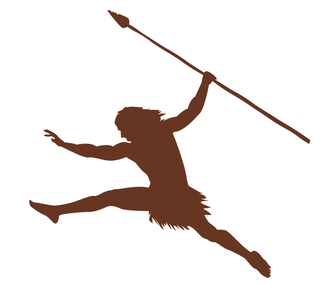 This project is meant to encourage folks like me that have never created primal fire. Hopefully these “training wheels” will build the confidence needed to start a ‘purist’ fire in the wild. Cut 4 pieces of 2 x 4 measuring 14 inches each. Cut another piece 9 inches long. Set aside the 14 inch long boards (frame) for now. Take the 9 inch board (guide) and drill a 5/8 inch hole about 4 inches deep into the end of the guide. Tip: Measure off four inches on your drill bit and mark the measurement by wrapping a piece of masking tape around the bit. Once you reach the tape during drilling, stop. I did this free-handed by clamping the guide to my work surface and drilling horizontally into the stock. Next, make a mark where you think the 5/8th inch hole stops on the wide side of the guide. Then drill a 1 inch hole that intersects perpendicularly with the first hole. The 5/8’s hole needs to completely open up into the larger hole you just finished. Now cut a 9 inch piece off the hardwood dowel rod you purchased from the hardware store. They sell these in different lengths. I bought a 3 foot oak dowel and another “hardwood” dowel measuring 4 foot in length. I paid $5 bucks for both. Tip: Roll the dowels on the concrete floor before you buy them. You want straight dowels. Insert the dowel into the hole in the end of the guide to see if it fits. You want it to move freely, but not to lose. I had to ream the hole just a bit to make just right. Once you’re satisfied with the fit, build the frame. Lay two of the frame pieces wide side down on the work surface. If you’re OCD like me, I marked off the center point on both of the bottom pieces. Place the 2 ¼ inch on the center line and mark the end of the tape measure and the 4 ½ inch mark. Scribe these lines to accommodate the other two 14 inch frame boards and the guide board, which equals 4 ½ inches wide when stacked together. Now flip the frame upside down so that the bottom legs of the frame are on top. Line up the top two frame boards (which are now on the bottom) with the lines and secure the two bases with screws or nails. You are now ready to secure the guide board on two cross pieces. With the bottom of the guide board flush and at a 90 degree angle to the two frame cross pieces, secure it with four screws/nails, two on each side. The completed kit after the first trial. Notice the black punk at the base of the hole. This may the most important piece. I had some soft pine stock that I cut to fit the horizontal hole. Cut the fire board about two inches long. You’ll also need to cut a ‘chimney’ into the stock. I cut a 1/8 th inch slot about halfway into the fire board. The chimney allows the hot punk (charred wood dust created via friction from the spindle on the fire board) to spill out. My bow is made from the remaining hardwood dowel. It needs to be around 3 foot in length. It’s not necessary that it shaped like a bow. The straight dowel works just fine. Drill a 1/8 inch hole in both ends of the bow. Then thread a six-foot length of cord through one end and tie a knot in the end of the cordage to secure it to the bow. Slip the other end of the cord through the other hole. I used 550 paracord. Find a piece of hardwood that fits into your hand comfortably. Create a divot in one side. The other side needs to be smooth as you’ll be holding it with your left hand (if you’re right-handed). You may use anything from antler, bone, wood, rock for your block. I used a piece of cedar from the handmade bench I made for Dirt Road Girl this summer. Lubricant will be need to be applied to the divot in the block to reduce friction while the spindle rotates. I used a bit of tallow the first test run. Then I used 3 in 1 oil. I was too lazy to walk back into the house for more tallow. Some people use green plant material in the socket. Whatever works and is available to you. 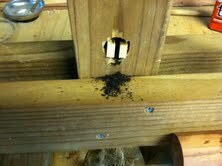 Tip: You’ll want to sharpen the end of the spindle that goes into the block like a pencil. The reduced surface space and causes less friction on the block. Use a pocket knife. It’s quicker at sharpening the spindle. Place the fire board into the horizontal 1 inch hole. Insert the spindle in the guide – flat side down. This is the business end that creates the friction. Wrap the cord from the bow around the spindle so that the loop is on the side away from the bow. Create the lo0p with the bow at an angle. Tighten the cord as tight as possible by pulling the slack through the hole at the opposite end of the bow. Once tight, wrap the remaining cord around the bow forming a handle. This allows for quick adjustments for tension on the bow string. 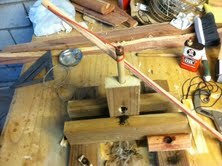 Now lift the bow to a horizontal position increasing the tension on the bow string around the spindle. With your left foot on the base of the frame, start pushing and pulling the bow in a horizontal position – 2 to 3 strokes per second. Apply downward pressure to the spindle via the block. Your left arm will be resting on your left knee or shin. After a few strokes, you’ll start to notice smoke. Keep spinning the spindle until the black punk starts to build up and pour out of the chimney. Decrease the pressure on the spindle at this point to prevent burning through your fire board. 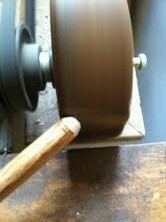 Keep spinning the spindle with smooth even strokes on both the push and pull movement. With some luck and experience, heavy smoke will begin to appear. Eventually the hot punk itself will begin to smoke. This is the point where your ember is created. Stop working the bow and begin blowing on the ember. I tried moving the ember and punk to my tender (frayed jute twine) with little success. I’m working on plans now to improve the horizontal hole to accept a larger fire board with tender already under the ember. I don’t mind admitting failure. But I’m no quitter. I’ve yet to start a fire from the ember. In last period Science class yesterday, we filled the room with smoke. It was a great object lesson on friction – fire was close, but no cigar. So my 50 year quest for primal fire continues. Stay tuned for updates. I’ll be in my laboratory (shop in the back yard). Update: I ditched the training wheels and went with the big boy model. Check it out here.